The new Nikon D80 is a 10.2 megapixel sophisticated DSLR designed for serious enthusiasts who want great images but don't have the budget for a high-end Nikon. The specs are impressive: new 12-bit image processing engine, 2.5" LCD, 0.18 sec. start-up with fast 80ms shutter response, three metering modes including spot, 3 frames per second, built-in flash with wireless commander, and bright 0.94x optical glass viewfinder. 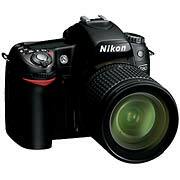 The body should retail for $999, or get the kit for $1,299 that includes the new 18-135mm DX Zoom Nikkor lens. Personally, I think the kit sounds like a better deal. This camera is clearly a cut about the D50 and D70. It has more resolution, better image processing, and lots of new features. It's not inexpensive by any means. $1,300 for body and lens is a sizable investment for most enthusiasts. But I think Nikon had done their homework here and put together a camera that will satisfy this demanding niche. I'll report more once the test results begin to surface. The camera should be available sometime in September. Great camera for my outdoor shots. Rgds. Hi for all D80 fans / look at my Benelux travel shots with D80. Thanx for look.